Yes, a driver with a spine. This is the claim to fame of this Wilson Staff driver. The concept being that the spine, or ridge line, adds force to the face behind the impact area. This is supposed to give you faster ball speeds. Wilson scooped out the weight behind the crown and moved it to the perimeter, thus giving the Wilson Staff Spine Driver a high MOI and a lower center of gravity. This is actually a pretty good looking club. I like the black head with the silver face. The dorsal fin shape, excluding the spine, reminds me a little of the Cleveland HiBore Drivers. You may want to take a look at the Cleveland Hibore XLS Driver. This is going to be a little more expensive than the Wilson, but you're getting a real "turbo-charged" driver. While we're on crazy head shapes, please take a gander at PowerBilt Air Force One Men's Geometric Driver. You're going to freak when you see this bad boy. It's a square driver head that is filled with nitrogen! 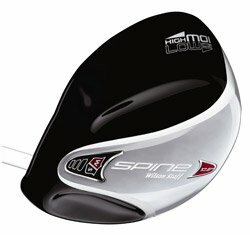 I recommend all of these drivers for those golfers who are looking for a big ol' forgiving clubhead that is going to give them more distance off the tee. Whatever the shape, remember higher MOI + larger clubface means longer and straighter drives.